Model & Type 101 hp@2200 rpm, DI, TCIC water cooled diesel engine. 101 hp@2300 rpm DI, TCIC water cooled diesel engine. Type Heavy duty transmission for crane application. Synchromesh gearbox with auxillary gearbox, Eight forward and two reverse speeds with high and low selector. Rear Mounted with two semielliptical springs. Clutch Single plate, heavy duty dry friction type clutch plate especially designed for crane application. Type Articulated power steering, hydraulically controlled through two double acting hydraulic rams. Front & Rear Fully air operated ‘S’ cam dual circuit brakes on front & rear axles. Parking Air operated fail safe brakes on front & rear wheels. 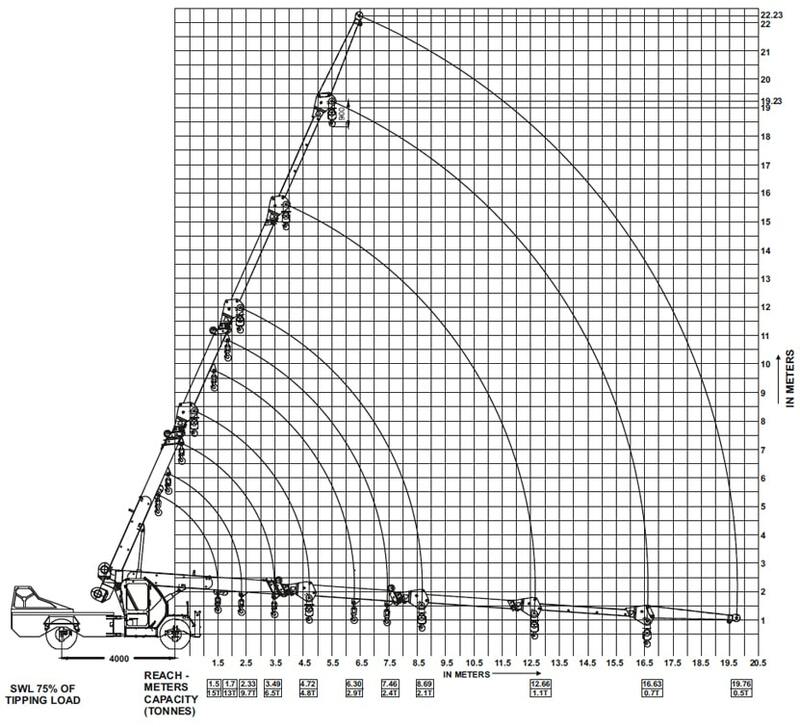 Telescoping 4 part boom, 3 part hydraulically powered & fully synchronised. 4th part power extended and manually pinned for safety. Derricking Through two double acting cylinders. Hoist Six falls with fail safe brake. Pump Vane type hydraulic pump. Control Valve 5/6 spool control valve double acting with built in pressure relief valve for trouble free operation. Counter balance valve for hose failure protection.